Eden Hazard has conceded that he still has a decision to make over his future, contradicting earlier comments which suggested he wanted to stay at Chelsea. As noted by Sky Sports, the Belgian international claimed after the win over Watford that he wanted to join the likes of Frank Lampard and Didier Drogba in being regarded as a Blues legend. That suggested that he had every intention of remaining at Stamford Bridge and to add to his tally of 101 goals for the club, as he continues to impress under Maurizio Sarri this season. 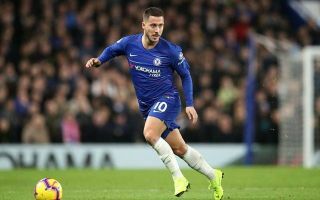 Hazard has scored 12 goals and provided nine assists in 22 games so far this year, and so clearly things are going well for the 27-year-old, albeit Chelsea are merely pushing for a top-four finish. Nevertheless, he has seemingly raised doubts over his future again by suggesting that he will not make any decision until the end of the campaign, while his current contract runs until 2020 and so renewal talks are arguably needed sooner rather than later. As noted by The Telegraph, a transfer raid from Real Madrid for their star man remains a threat for Chelsea, with Hazard doing little in the past to hide his desire to play for the Spanish giants. In turn, time will tell if they make their move for him in the summer, or if he continues with the Blues and pens a new deal to finally end speculation surrounding his future which would undoubtedly delight the Chelsea fans and all concerned.